Today marks an anniversary of an historical event mateys! 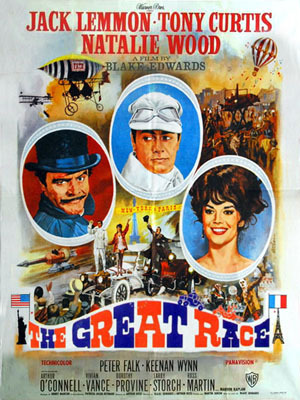 Actually, everyday is an anniversary of some notable historical event.... but this one caught me fancy since last week my family and I saw Blake Edwards' 1965 film " The Great Race ". Yes, today be the anniversary of the actual Great Race. 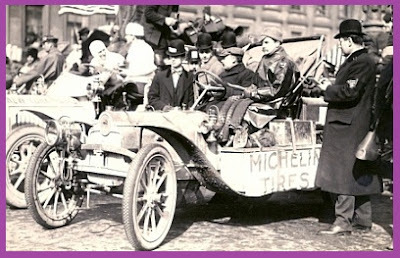 Tis 104 years since the extrodinary 21,000 mile tour-de-world auto race took place. In 1907 a Parisian newspaper asked its readers " Will anyone be wiling to drive from Peking to Paris next summer? " ( 10,000 miles) and incredulous as it sounds, 25 teams signed up to give it a try. The day of the race however only five appeared at the starting line, and of those only four succeeded in reaching Paris...three of them 21 days behind the winner. 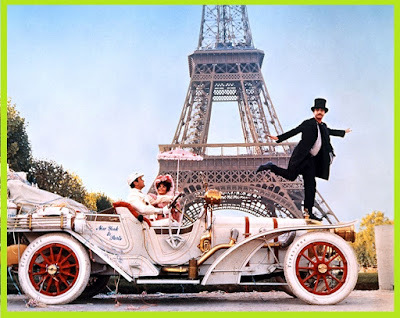 However, the media response was enormous....so much so that the day the Peking-to-Paris race was completed Le Matin ( the Parisian newspaper ) announced another race...an even grander race. 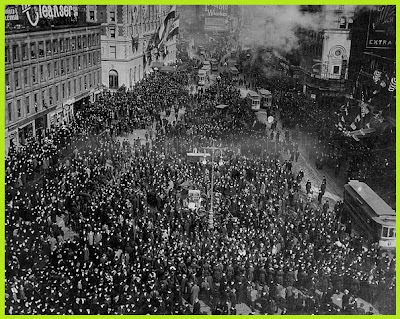 On February 12th, 1908 two hundred thousand people showed up in Times Square, New York City to watch six competitors start off on a 165 day race to Paris, France. A counter-clockwise circle of the world via auto. Of the six competitors, the American Thomas Flyer with its team comprised of George Schuster, Montague Roberts and Harold Briankes and the German Protos were the fan favorites. Kaiser Wilhelm II saw the race as a chance to assert Germany's surpremacy of the motoring industr and so urged the leading German auto manufacturer, Protos, to enter a car. 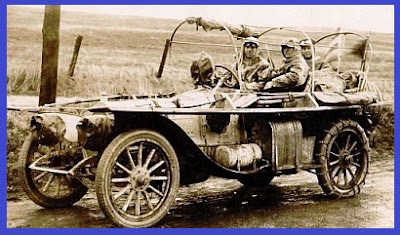 The Protos was driven by Hans Koeppen, a lieutenant in the Prussian Infantry, military engineer Hans Knape and an officer, Ernst Maas. Other competitors included an Italian team driving a Zust, and three French teams driving a Motoblanc, a De Dion, and a little Sizaire-Naudin. And away they went! Amidst cheers, and flag waving and back-firing smoke they took off in a flash. But alas, the flashy start slowed down quite a bit once they were on their way. The race was extremely difficult. Rain, mud, snow and ice immediatly tested the reliability of the cars. The Midwest was hit with one of it's worst blizzards in years and the racers went head first into it. Reportedly, it was so cold that the Italians had to break their sandwiches in pieces with a hammer and defrost them on the radiator before eating them. 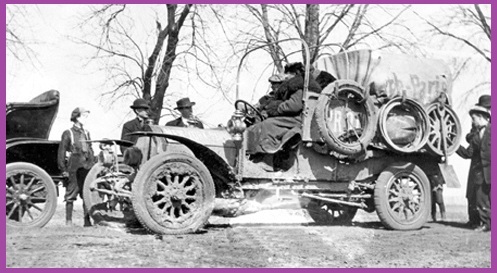 The Thomas was the first to reach the Pacific coast ( after 41 days of road travel ) while the Protos was weeks behind. The other competitors were not even in the race - so to speak - they fared so much worse and were all having disputes among their crews. Although the Protos was built like a tank and was designed for all types of terrain, it was not prepared for good ol' American mud. Knowing that the competitors were behind schedule, the race commitee considered allowing the cars to be shipped directly to Siberia, but then decided to stick to thier original rule : Drive across Alaska. As the Times pointed out " the attempt to cross Alaska at this late date is foredoomed to failure". But George Schuster thought not! And he was ready and willing to trek across the barren land. With the Thomas Flyer flying ahead by a 800 mile lead, Hans Koeppen made a decision that cost him dearly...in an effort to gain time he loaded his car onto a train and in this way covered 1000 miles. At first he was disqualified, but was later readmitted with 15 days penalty. Devious tricks like these he played throughout the race; in Vladivostock, Russia he disregarded the race commitees instructions and took off without waiting for the Thomas and later shipped the car by rail across Trans-Siberia. 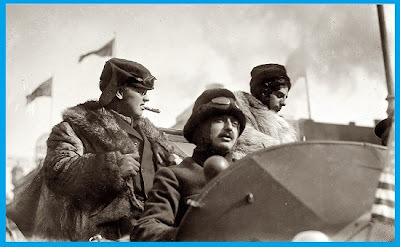 Eventually, George Schuster and his Thomas Flyer had a breakdown in Manchuria and it was Hans Koeppen and his Protos that arrived first at the finish line in Paris. However, the crowds cheered for the intrepid American and gave him the winning hurrahs. George Schuster became the true winner when the race commitee revealed that due to "penalizations" the Protos was in fact days behind the Thomas Flyer. Blake Edwards immortalized this famous race and the sportsman-like behavior of Schuster with the character of the Great Leslie ( played by Tony Curtis ) in his 1965 comedy "The Great Race" and even included a devious opponent...Professor Fate ( Jack Lemmon ) and his tank-like gadgetry filled Hannibal 8 automobile. Some say the movie had no resemblance at all to the real race but I must differ....the teams did in fact stop in a town in the west to recieve a rousing welcome ( alas, but there was no Dorothy Provine belting out " He Shouldn't-a, Hadn't-a, Oughtn't-a Swang on Me" ); the Thomas Flyer followed the railway tracks to save time at one point - much like Prof. Fate tried to; a reporter from the New York Times joined one of the crews to be there to report the latest news, just like Natalie Wood did; the village folk of Germany came out in droves to cheer the passerbys ( especially Hans Koeppen ) and last but not least Professor Fate crossed the finish line first...just like Koeppen did. Gosh, how many more similiarites could you ask for? 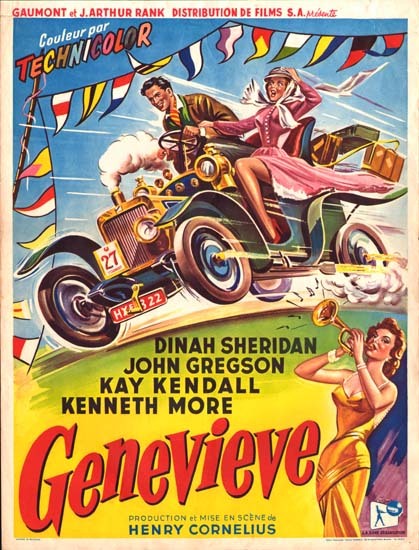 And with those catchy Henry Mancini tunes added in for good measure, the film was just as fun as participating in a GREAT RACE ourselves. ( Although, that doesn't mean I'll cross that item off my list of Things to Do ).